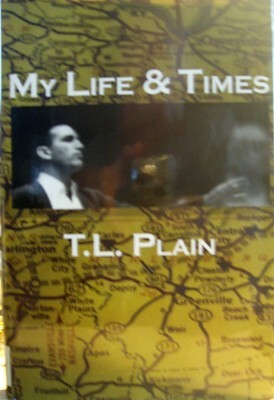 A book written on his memoirs, covering everything from his childhood through present day in Owensboro, KY.
T. L. sent me a copy of his book and I found it was some very interesting reading material. Head Coach at Henderson City High School, 1955-1957. T. L. (full name is Truman Layton Plain) Plain, was the consummate coach, demanding excellence, and he received it!!! He stressed teamwork, and he received it!!! He demanded discipline and he received it!!!. He demanded dedication and he received it!!! Above all, T. L. stressed "Teamwork" as his priority in coaching. County 1951 & 1952 seasons. Head coach at Barret Mauual Training from 1953 to Barret's closing in 1955, & at the new Henderson High City 1955 through 1957. (both as head coach in baseball & basketball). School from 1957 to 1959. Coach of KHSAA West all-star basketball team that defeated the East all-stars in the last of this series between the West & east all-stars. Head coach at Kentucky Wesleyan from 1959 to 1963. Head coach at Vincennes High School from 1966 to 1968. Assistant coach at University of Louisville from 1969 to 1971. Head coach at Utah State University from 1973 to 1976. Retired from Executive Inn in Evansville, Ind. as coordinator of convention sales in 1996. The McLean County native from Sacremento, KY graduated from Western Kentucky State Teachers College (now Western Kentucky University), and received his master’s degree from Murray State. Coach Plain has resided in Owensboro, KY. with his wife Juanita since 2005. His fondest memories of Henderson City High coaching was the great group of athletes that he had. Coach Plain said he never had a problem with any member of the Barret teams or the Henderson City teams. Coach Plain said the best basketball player he ever coached was Kelly Coleman. Even though Kelly Coleman was a totatally undisciplined player, he was the purest shooter he ever saw. T. L.'s finest years in Henderson, the 1955 Barret baseball team finished 4th in the state tournament, and finished 3rd in the state baseball tournament as head coach at City High in 1956. His 1954-55 Barret basketball team finished 3rd in the Kentucky High School sweet 16 contest, and finished 2nd losing with a very tired team.namely Carr Creek High School in the state finals in the 1955-56 season. Coach Plain had nothing but praise for Pascal Benson. Coach Plain does name another player as his all-time favorite player to coach. That high school boy was Sammy Joe Shelton, whom Coach Plain calls Mr. Do anything and everything, a Charlie Hustle years before that phrase became popular, in every sport he played and he said Sammy played them all to perfection. He also called Sammy the most disciplined athlete he ever coached. In this writer's opinion, those are the highest praise any coach can bestow upon an athlete. That about says it all!!!!!!!!!!! Dave Eakins stated that the replacement for retiring legendary coach Adolph Rupp was between the top 2 assistant coaches at U. K., T. L. Plain & Joe B. Hall for the head coaching job. Isn't it strange how fate works? Again, fate denied greatness for T. L. Plain. Donald A. Chapman, 85, Henderson, passed away at 2:17 a.m. Saturday, Feb. 18, 2012, An educator for 43 years, Don retired from Henderson Community College where he taught for 27 years. Survivors include his wife of 27 years, Elizabeth "Betsy" Chapman. Assistant basketball and football coach at Barret from 1952 through 1955 & at the newly constructed City High from 1956 and 1957. Head basketball and baseball coach at Henderson City High from 1957 through 1959. Principal at Henderson County High School in 1970 -71. Guidance counselor at the Henderson Community College 1974-1976. This native New Yorker, Don Chapman graduated from Western Kentucky in 1952, and was a punter on the Hilltopper football team. 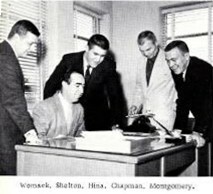 Don Chapman, was the perfect assistant coach with T. L. Plain's style of basketball. Don replaced Coach Plain when T. L. left for Vincennes. He remained at the helm for 1 1/2 years. Don resided in Henderson until his death, and was married to Betsy (Royster). 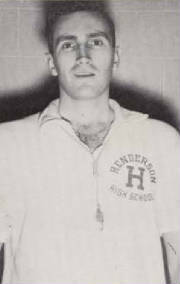 Henderson City High Coach 1955-1956. Training High School, 1952, 1953, 1954. Head Coach: Henderson City High School, 1955-1959. Head coach: Murray State University, 1960-1966. Henderson City High School, 1956-1959. A four-sport high school star at Barret in the mid-1940's, Shelton went on to earn four football letters at the University of Louisville under former Barret coach Frank Camp. Shelton would return to Barret in 1952 as football coach, where he posted a career record of 45-24-5. His 1955 Henderson City High team was 10-0 and won the mythical state championship. His 1959 team finished 12-0 and captured the first-ever Class AA state championship. Shelton later was head coach at Murray State. Through the 1959 football season, Don Shelton was the only KHSAA coach to have two undefeated seasons. Shelton & his wife Judy were residing in Covington KY. relocated to Ocala, FL in 2009. On a sad note, Coach Don Shelton passed away Oct. 4, 2011, at the age of 83 in Ocala, Fl. Coach Chester Montgomery coached the Flash basketball & baseball teams from the 1960-61 into the 1962-63 season when he resigned in midseason of the basketball season to scout for the Pittsburgh Pirates. His best season was the 1961-62 season leading the Flash basletball squad to a very respectible 20-7 season.